PoppaNut and I are pretty much homebodies. We like to stay in, watch movies, play games and just hang out most weekends. It is our chance to sit back, relax and enjoy the life we have created for ourselves. But every once in a while, we mix it up! And that’s exactly what happened on Saturday night, much to our surprise. We decided to head out to dinner to Chili’s on Saturday night. As we walked into the bar area, we saw two friends: Sam and Kelly. Sam was a groomsmen in our wedding, and Sam and Kelly are good friends. But as life gets busy, you can lose touch with people. And that’s exactly what happened. So, it was such a nice surprise to see them at Chili’s. We ate our dinner, catching up with them between each bite. After that, we decided to head to a local bar for some good ole bar games: the bowling game and the punching game. Now, I used to be a pro at the bowling game. 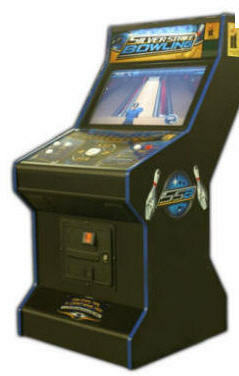 PoppaNut and I would play it all the time, and we would both get strike after strike. Well, it seems I have lost my touch, because I played TERRIBLE. But, it was fun none the less. PoppaNut had his eye on the punching game as soon as we walked in the door, so we headed there next. With tons of singles in hand, PoppaNut pumped that machine full of money and went on a punching roll. In fact, he beat the high score! All in all, we had a great night. It was so fun seeing Sam and Kelly again, and mixing things up by heading out to the bar on a Saturday night.